Well…it’s autumn now, isn’t it? And that means soup. 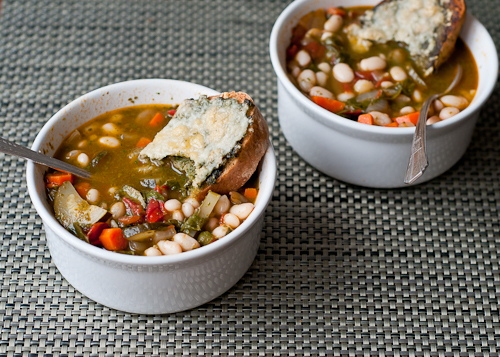 Lots and lots of hearty vegetable-filled soups. 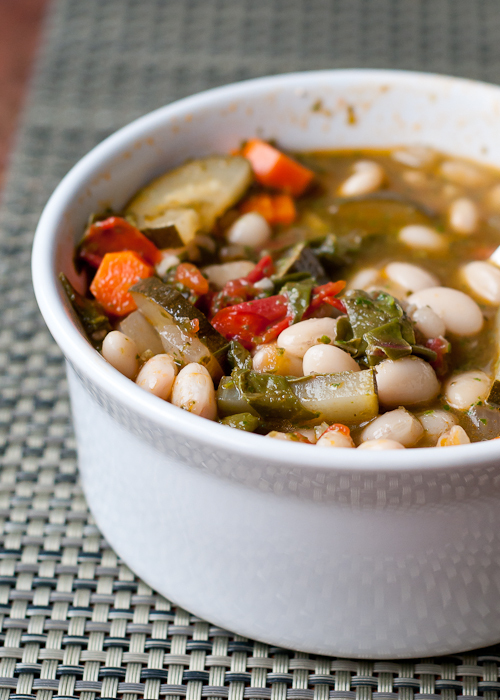 This soup is chock full of healthy veggies that won’t leave you missing any meat. Add a tasty pesto-Gruyere toast and you’ve got yourself a five-star dinner. I used veggies that I had on hand. You could add other veggies like sweet potatoes or winter squash, different leafy greens (kale or shredded spinach would be nice), celery, leeks, fennel, parsnips, turnips or rutabaga. Add more herbs if you want–rosemary, thyme, marjoram or parsley. 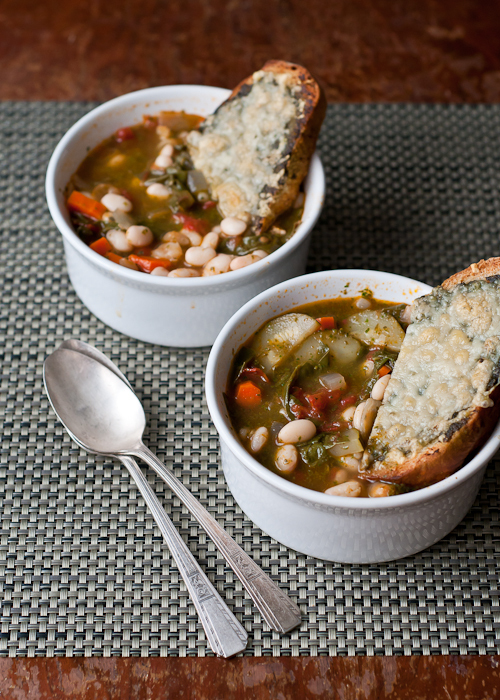 It’s kind of one of those whatever-you-need-to-use-up kind of soups. It is very similar to minestrone soup. 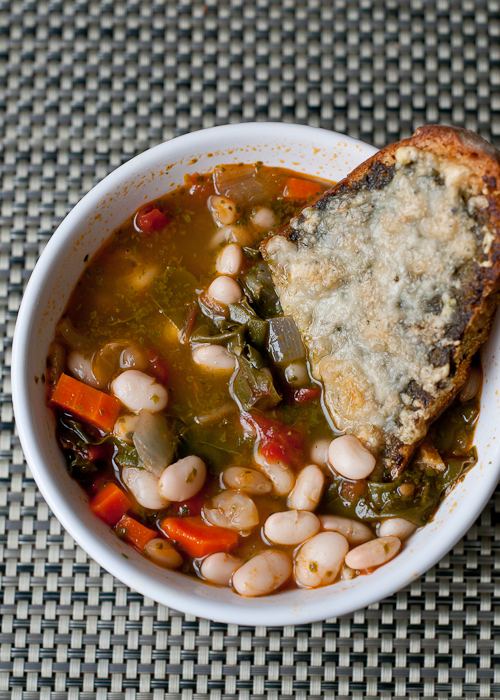 Actually, this basically is minestrone without the pasta. But you could add that in too, if you want. Heat a little olive oil in a 3-4 quart pot. Add the onions and cook until they start to soften. Add the carrots and garlic. Continue cooking for a few more minutes then add the diced tomatoes. Cover with water–maybe 6-8 cups. Cook until carrots are almost tender. Add the zucchini and simmer until it’s almost cooked through. Add the beans and chard, simmer for another 10-15 minutes. Taste and add salt and pepper and pesto, if using. Serve hot with pesto-Gruyere toasts. To make the toasts, preheat oven broiler to low. Spread a little pesto on the bread slices and top with the grated Gruyere. Broil until cheese melts and turns golden. Remove from oven and cut into halves. Serve hot with the soup. Makes enough for 6 good-sized servings. With this fall weather, I am in such a soup state of mind. This looks delicious…especially the crusty bread with pesto and cheese!